Round One of the ATOMIC NOIR SHORT STORY CONTEST is closed. Several great submissions are in and the selection process is underway. Big thanks to all who submitted. It was short notice and high stakes, and you came through like champs. The next round begins August 1. Read the guidelines and be ready. Subs will only be open for two weeks at a time from here on in. In the meantime, we have a contest within the contest. 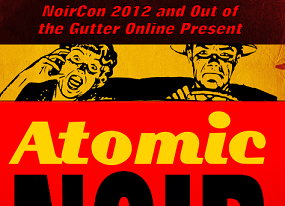 Lou Boxer, ATOMIC NOIR judge (along with Duane Swierczynski) and the man behind NOIRCON, needs your help. He has begun composing the introduction to the volume, and to support his thesis he will be including examples of what "noir" is perceived to be by readers and writers. The process is simple. In 75 words or less, in the comment section directly below this writing, describe how you define "noir" and what the term means to you. If Lou uses your definition/explanation, you get a signed copy of the book--which, of course, will now include your thoughts in the introduction. Lou will be reading with interest and we will contact you via your Disqus ID to let you know you're in and to get a mailing address. So, what is implied by the word "noir," in objective terms, subjective terms, or both?